I’m still aggravated from spending over 1,100RMB (US$185) this afternoon to try and get a filling done on my tooth at a nearby international clinic, but at least I was able to enjoy the snowfall, Beijing’s first for the year and season, and a few online links. First, the reason I had to get a filling is because my previous filling just flat out came out. It got dislodged on Wednesday in the Nanjing South train station as I was eating a salty duck jianbing (pancake) which was particularly chewy. The reason why I said I tried to get a filling done is because the dentist failed to do so, having spent over 10 minutes prodding into my mouth with a needle to apply the anesthesia without any success. She even used a second needle, as at one point she asked her assistant to change it. Admittedly the tooth is the furthest back in my mouth, but it is disappointing that a supposedly qualified and highly paid professional can’t carry out such an ordinary task. The only good thing is because the filling wasn’t actually done, I didn’t need to pay a further 1,000 RMB. I will visit Taiwan in a few weeks so hopefully my former dentist there can help me. I’m not wealthy but the reason I went to this clinic is because I wanted to deal with an English-speaking dentist. Back in Taipei, I saw my dentist for years, having first gone with my mother, so I trusted him. I was doing some random blog browsing earlier in the day, and I came upon a surprising bit of news about Shinzo Abe, Japan’s Prime Minister, who was also PM in 2006 but only for less than a year. The blogger claimed Abe resigned the first time around, because of a seriously upset stomach. Basically, he suffered from chronic diarrhea due to ulceratis colitis, a bowel disease caused by ulcers and which results in frequent and bloody bowel movements. At first, I thought the blogger was just saying nonsense to be mean, but it turns out he was saying the truth – Abe did step down as PM because of chronic diarrhea. Now I’m no fan of Abe, his policies or Japan in general, but when I read the piece, I can’t help feel some sympathy. As someone who has longterm bowel issues myself, the thought of someone suffering from a serious bowel disorder and still becoming prime minister is kind of admirable. Coincidentally, ulcerative colitis is also what forced Manchester United player Darren Fletcher to be out of football for some time. Fletcher, a Scotsman, has come back as his condition has improved. The NY Times has a list of 52 places around the world to visit, and number one is … Cape Town, South Africa. 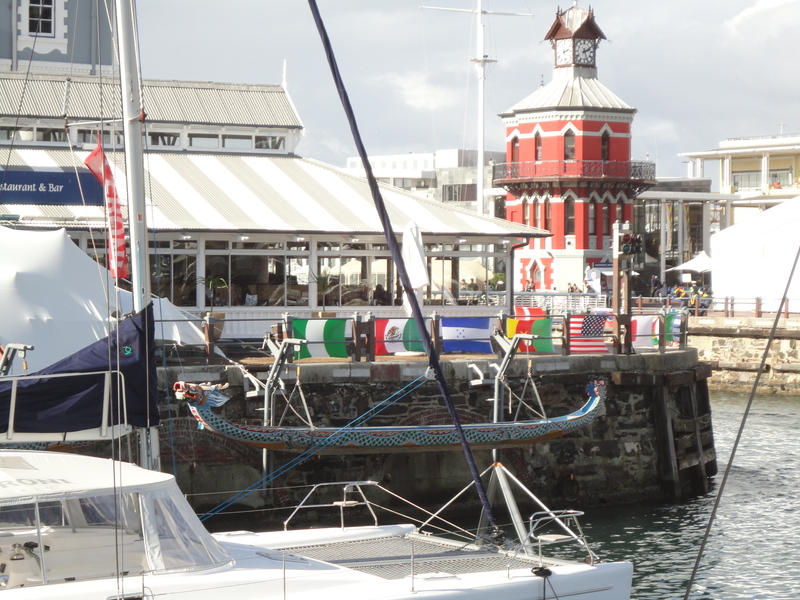 It’s a great choice – the city is scenic, boasting the impressive Table Mountain which looms right over it, historic, and has a fair bit of culture and of course, glamor. For me, it is the most beautiful city I’ve ever been to. Of course, I’m sure many of the other places listed are pretty good to visit too. Meanwhile, here’s something about Scandinavia, specifically some negative stuff about countries that we often only hear good things about. A British writer wrote in the Guardian about problems with Denmark, Sweden, Norway and Finland, half tongue-in-cheek and half serious, and not surprisingly, he got spirited responses from people from those countries, with a bit of banter thrown in. Here’s what they said, as well as the British guy’s defense. The Brit actually wrote an entire book about those Scandinavian/Nordic countries as well as Iceland that was recently released. Last year, I visited Cape Town for a few days and I found it a splendid city and the most beautiful one I’ve ever been to. However the Guardian had a bleak article about Cape Town, using Desmond Tutu’s celebration of his 80th birthday last week in Cape Town to lament the extreme inequality of that city. It seems a bit harsh, but for sure there is a lot of poverty right outside the city in the vast low-income and shanty neighborhoods that include townships like Gugulethu and Khayelitsha, said to be the biggest township in South Africa with over 1 million people. 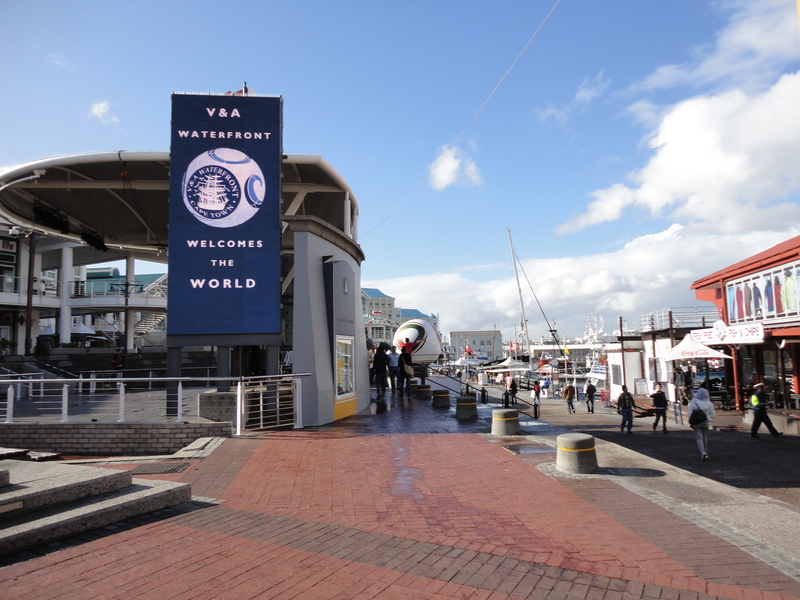 The city itself is really nice and has a European or San Francisco feel to it, with good museums and scenic places like Table Mountain and the V & A Waterfront. Yet as my tour guide mentioned (and which the article also describes), Cape Town is great for tourists but not for many locals, alluding to the poor, most of whom are blacks or colored. It’s a striking example of the vivid issues and problems that afflict South Africa, and make it such a fascinating country. 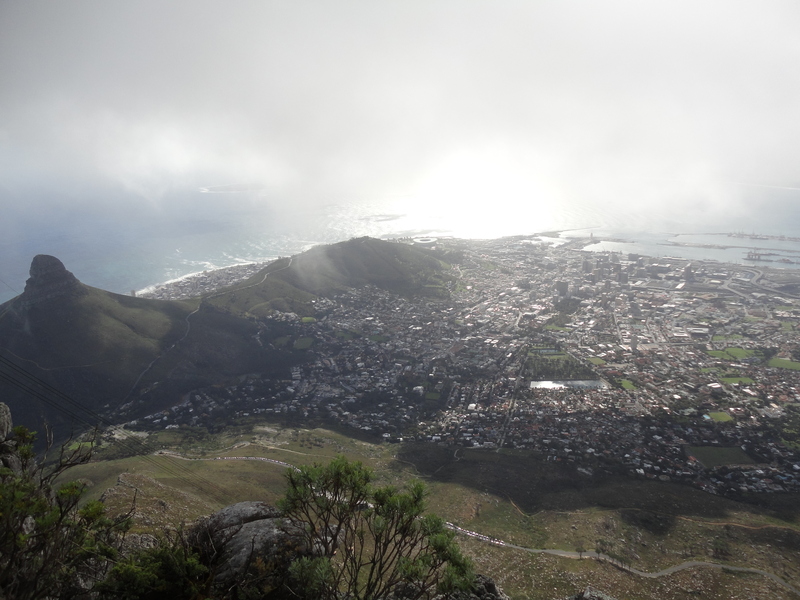 These are a few pictures showing Cape Town in all its splendor. 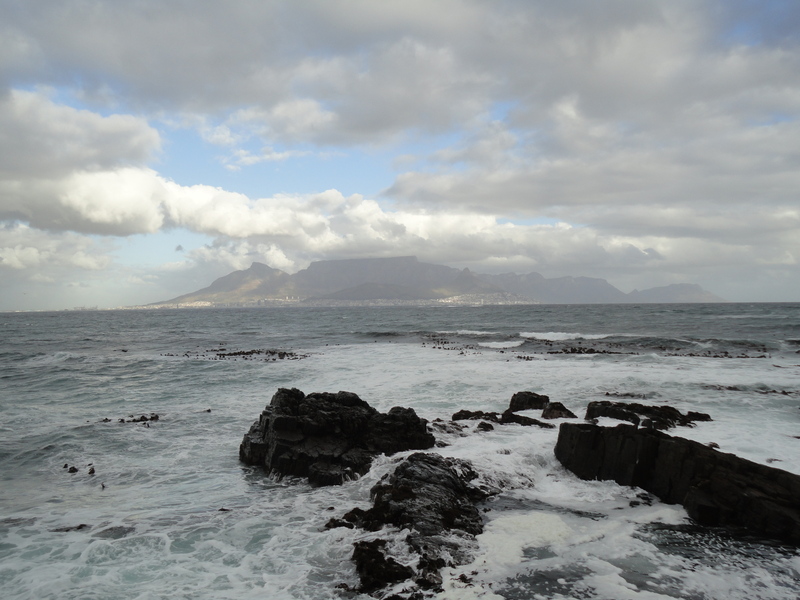 This should be my last post on Cape Town regarding my stay there, but you never know. Table Mountain viewed from the V&A Waterfront. 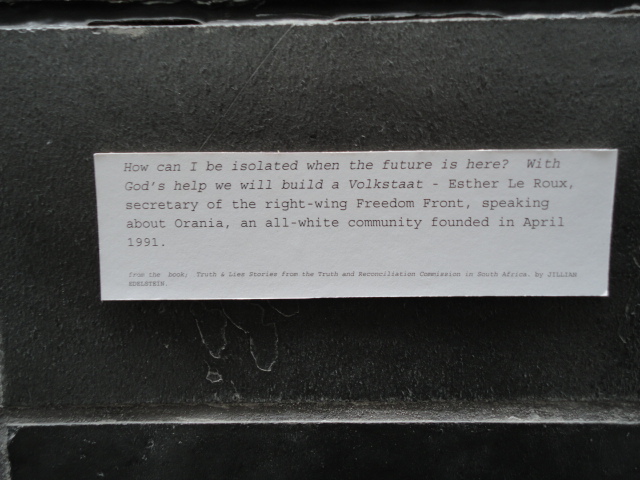 These signs showed testimony from the Truth and Reconciliation hearings that were chaired by Desmond Tutu during the 90s to promote reconciliation. 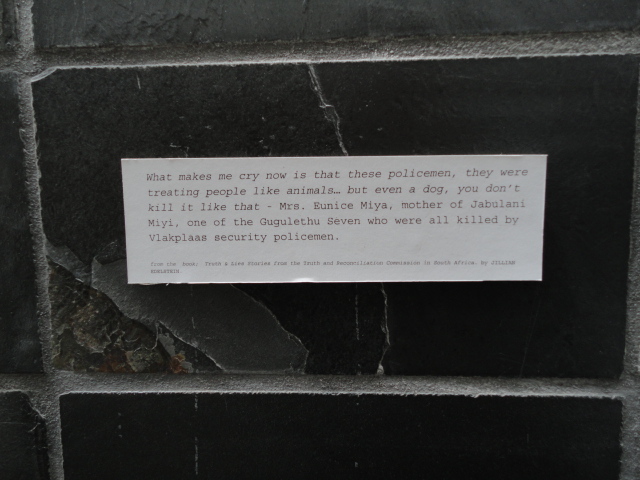 This was part of an exhibit inside the Mandela Robben Island ferry pier. 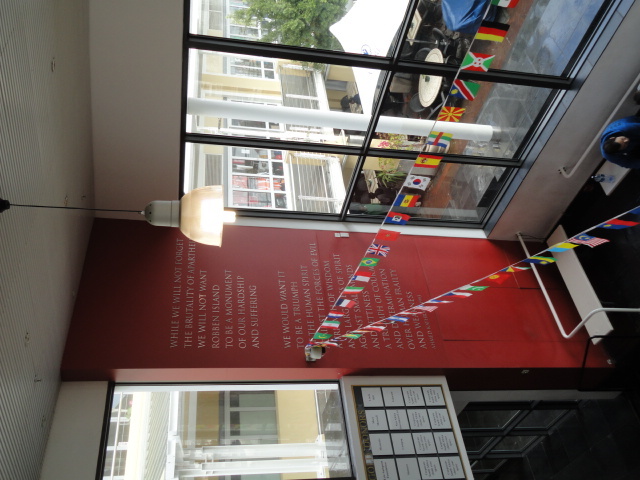 The words on the wall at left read: “While we will not forget the brutality of apartheid, we will not want Robben Island to be a monument of our hardship and suffering. We would want it to be a triumph of the human spirit against the forces of evil, a triumph of wisdom and largeness of spirit against small minds and pettiness. A triumph of courage and determination over human frailty and weakness.” Wise words indeed. 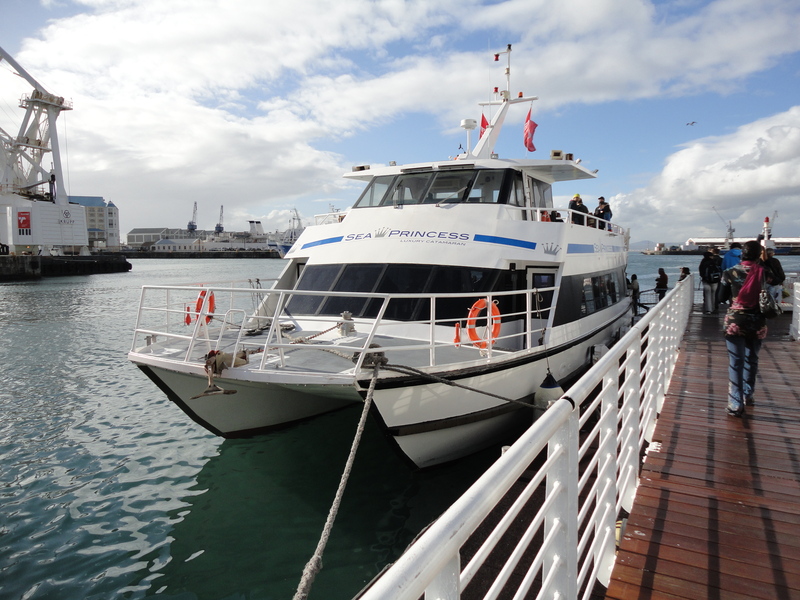 At right is the sleek catamaran that was our ferry. 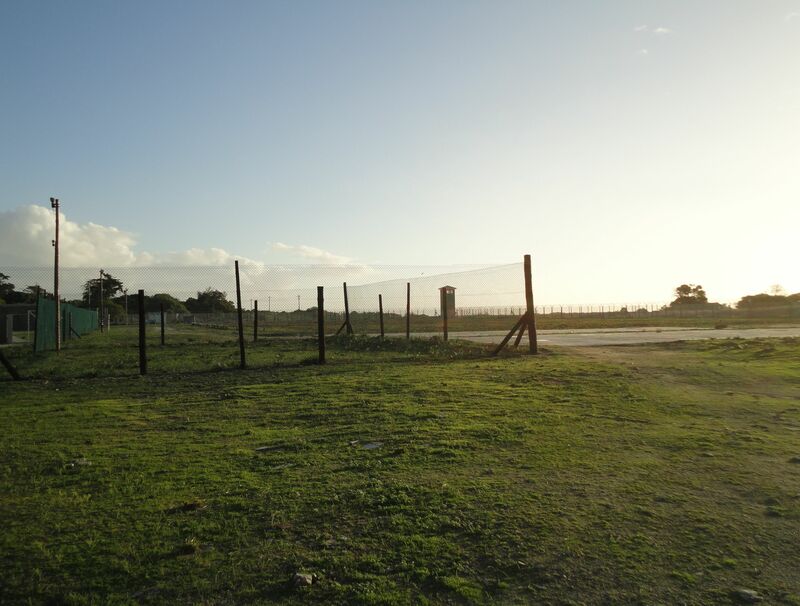 At left is the limestone quarry or “Robben Island University” where Mandela and many other prisoners taught and learnt from each other. 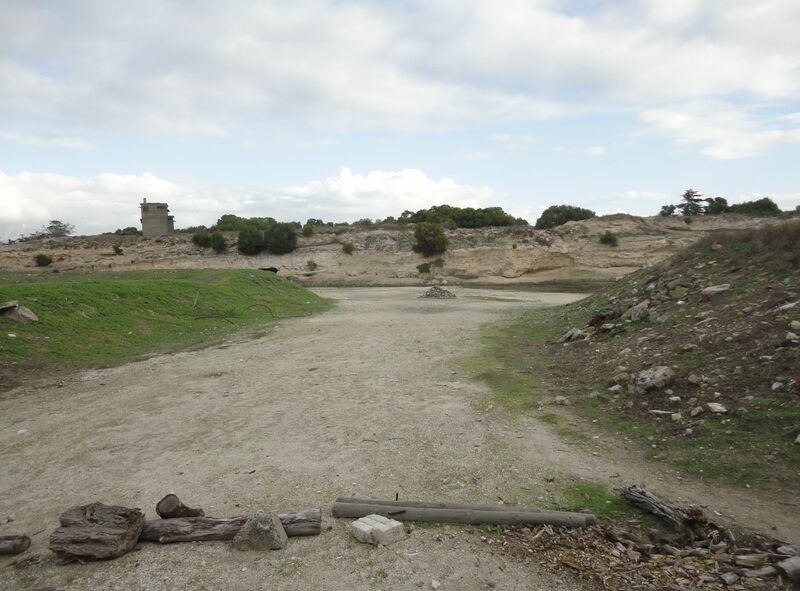 According to the guide, the limestone posed health risks especially to prisoners’ lungs. Mandela got off lightly, because the main health problem he got was damage to his eyes and tear ducts, preventing him from shedding tears when crying. 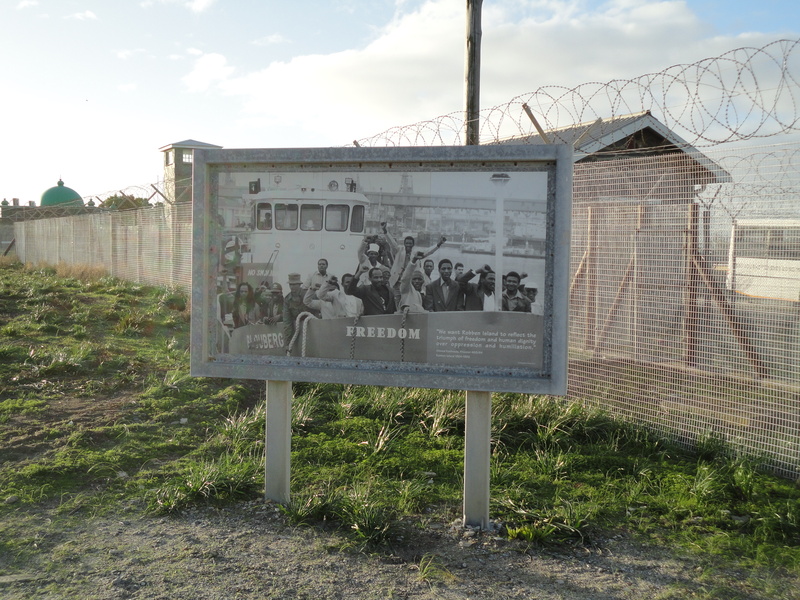 At right is a sign near the entrance to the maximum security prison. At left is the outside of the maximum security prison. 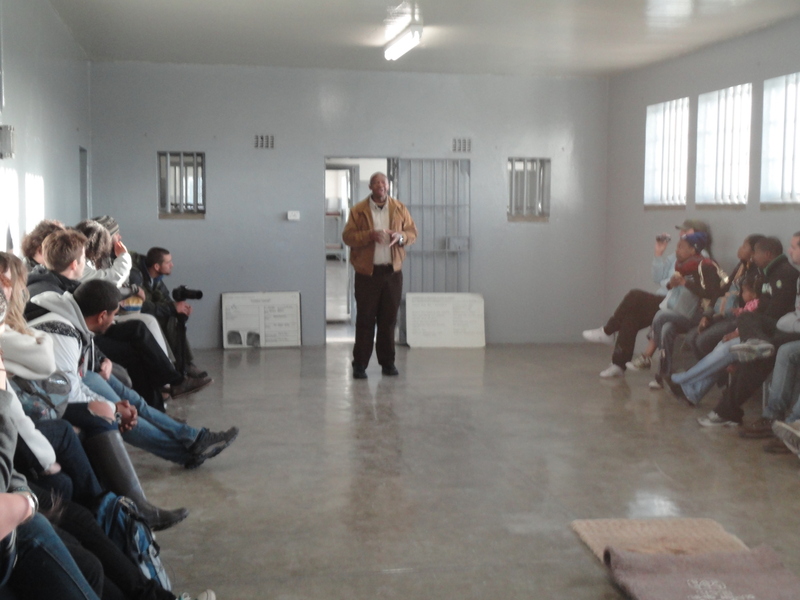 Meanwhile once we got inside, “Sparks” started off the tour by giving us a talk in a cell where 60 prisoners were kept at a time. The charts showed the specific dietary allocations for prisoners of different races. Needless to say, blacks got less than the others. 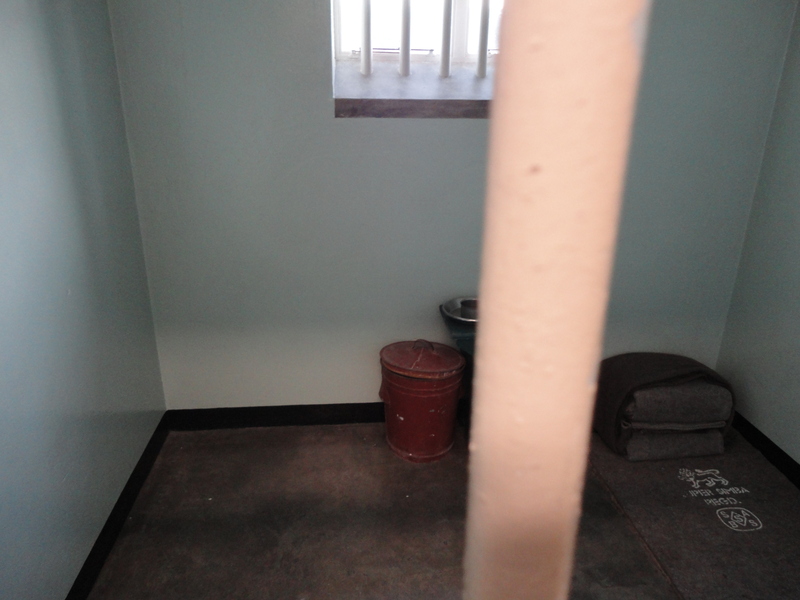 At left is Nelson Mandela’s cell, small, nondescript and toilet-less. 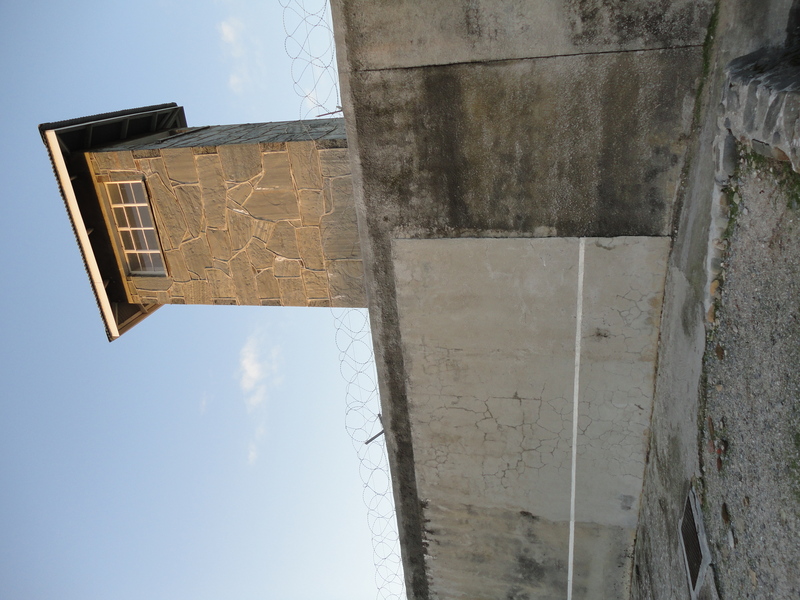 At right is a guard tower seen from outside the compound. 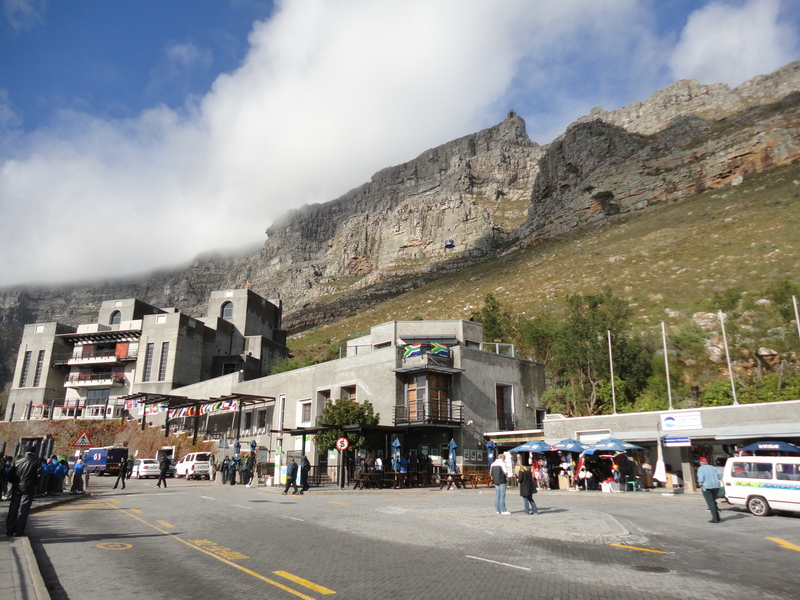 It’s impossible to leave out Table Mountain when talking about Cape Town, but I almost didn’t get to go there. It rained on the day I had scheduled a hike up there and it got canceled. However, on the morning of my last day, the weather cleared up and I hastily (without any reservation whatsoever) decided to go up there. I only spent less than an hour on top and I had to rush back to meet my airport pickup (who ended up waiting 10 minutes) but it was worth it. 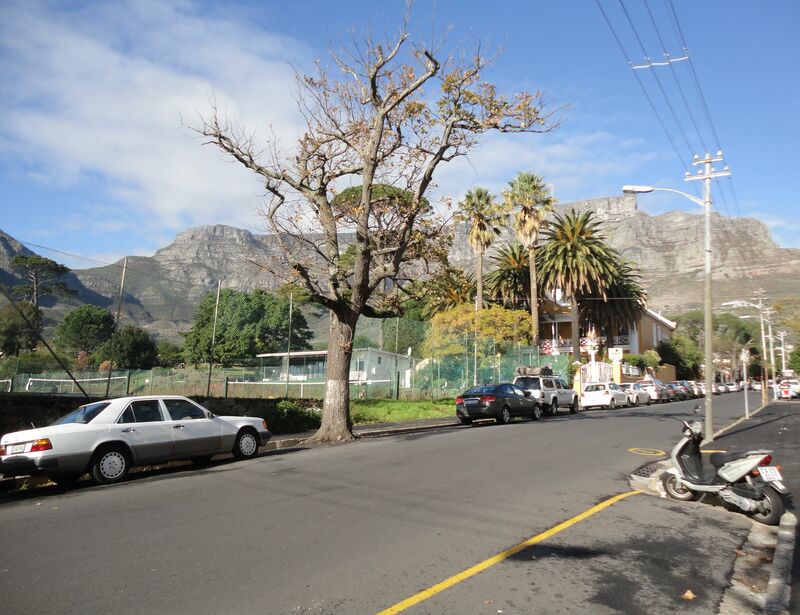 This is how Table Mountain looks on a good day from the area I stayed at, left, while the right-side picture shows Table Mountain from the cable car station. 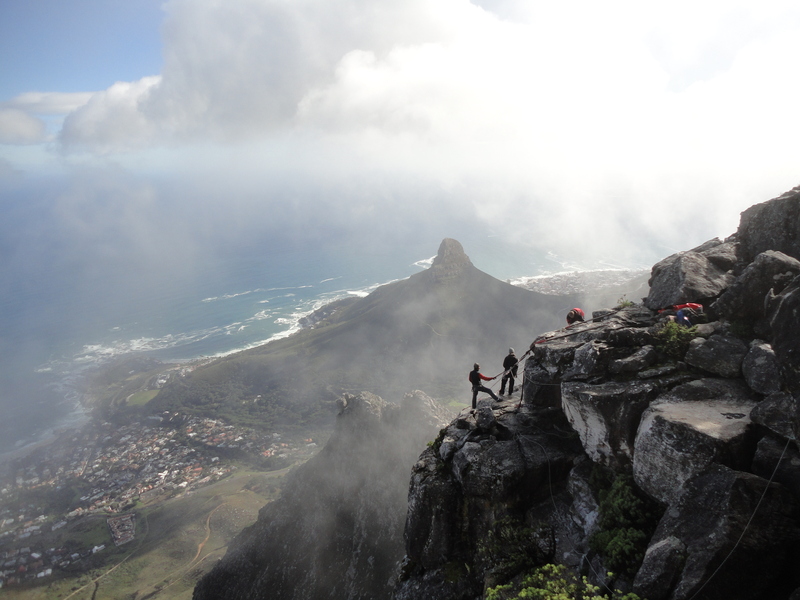 People abseil (scale down a cliffside) on the side of Table Mountain facing the Atlantic. The city centre is on the other of Lion Rock, the peak in the middle. The city centre, with Lion Rock and Signal Hill on the left, and the city’s World Cup stadium, Green Point, the bowl structure in the background middle. There is too much glare otherwise the photo would have been much better but it couldn’t be helped.